Jon and I have a Sunday morning tradition: pancakes. This Sunday, however, I'll be on a plane to DrupalCon Chicago, so we decided to do our pancake "date" this fine Saturday morning instead. We usually make our favorite gluten-free/dairy-free buckwheat pancakes, but this morning we decided to be more inventive and attempt for something more classic. The result? 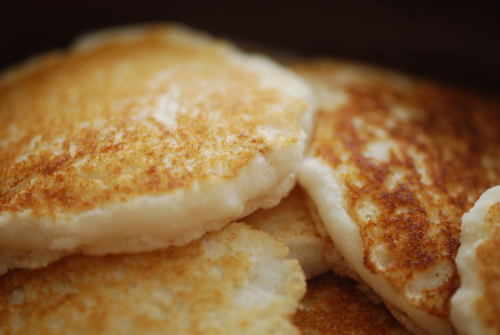 Classic style pancakes made with a blend of coconut and potato flours! They were delicious! They did have a sweet, coconutty flavor, which went very nicely with vanilla infused maple syrup and bacon. Mix everything together and cook on a griddle the way you like!